HandsetExpert | Google Chromecast: What is it? 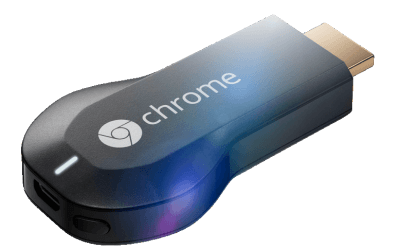 Chromecast: What is it and what can I use it for? Last week, Google released the £30 Chromecast stick in the UK, following its release in the States last year. Here we take a look at the Chromecast and what you can do with it. Setting up the Chromecast is quite simple. First, you plug in the Chromecast dongle to the HDMI port of your TV and a power source (you can either plug the Chromecast in a USB port on your TV if it has one, or plug it into the mains). Then, you configure the dongle by downloading the Chromecast app on your phone or tablet, or install the extension for the Chrome browser for your computer. Once you've done that, you're ready to stream. At the moment, you can get the Chromecast from directly from Google (adds £3 P&P), Amazon (P&P from free), and PC World/Currys (P&P from free with in-store collection). If you're looking for a way to view online content or view content from your phone on your TV, at £30 the Chromecast is a cheap and convenient method to do it. It's not without flaws; the Chromecast is mainly meant for streaming online content, and whilst you can do things like stream local files from your computer, the process is a bit cumbersome and buggy. Also, as mentioned before there are relatively few apps that currently work with Chromecast, although that will improve over time. If you are looking for alternatives, a lot of newer TVs have built-in Smart functionality, giving you similar access to online services although the interface for most Smart TVs tends to be rather clunky and counter-intuitive. Other devices that can be used for similar purposes are Now TV, Roku 3 and Apple TV. Check out Droid Life's comprehensive overview of Chromecast.